Gujarat is witnessing a unique movement against the proposed amendment to the right to information (RTI) Act, which seeks to keep political parties out of the RTI ambit. While all political parties are supporting the amendment, a campaign by the Mahiiti Adhikar Gujarat Pahel (MAGP) has shown people are against it. The campaign -- which is spread to major cities, towns and villages -- last reached Surat, where awareness meetings were held in City Light Area, Maharana Pratap Garden and SVR college, Udhna-Magdalla road and Varachha road. "Interaction with the people suggested that people have unanimously rejected political parties' move to keep away from transparency", MAGP volunteers said. In fact, at the ballot box put up to vote on the proposed amendment, thousands turned out to vote against it, and no vote was polled in favour of the political parties. "We are planning to collect over 50,000 votes", said Pankti Jog of the MAGP, adding, "Already, 8,000 people have polled in the ballot against the amendment, none in favour of it." . 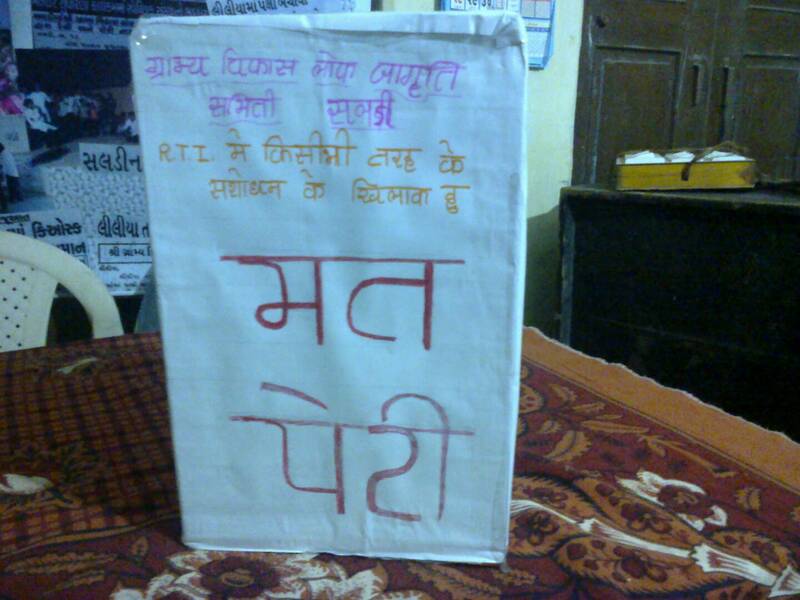 The campaign has spread from the gram sabhas to the social media. "We plan to start an email campaign, where citizen will send one email to the President of India. It is planned that more than 1000 people will send email to the President before July 15, which is our last day of the campaign", Jog said. This is the date the political parties have to appoint public information officers as per CIC address. "As part of the campaign, ballot paper is being circulated to citizens' groups across state who are actively on RTI awareness and promotion. 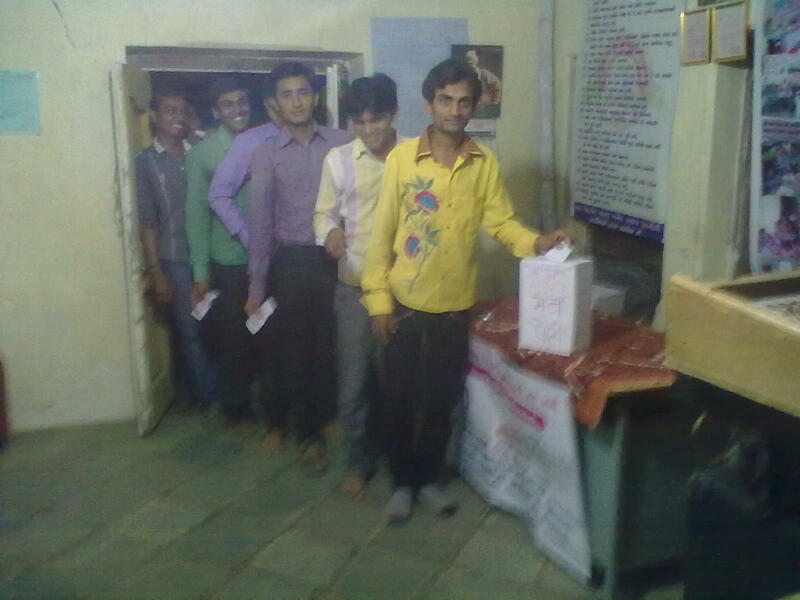 College youth from Saladi village in Amereli district came in heavy numbers to vote against the amendment. There was also discussion in the Gram Sabha on why parties are shying away from transparency. As for Surat, "groups are taking this as an opportunity to bring issue on agenda. Holding small outreach programmes in garden, colleges. ad having signature campaigns. Few others are are planning will give memorandum to party representatives. They have planned e-poll and e-petition, asking renowned people to write letters to the editors of major papers, and so on", she said. Claiming that "response is very good", Jog said how people are reporting on the RTI helpline that even political party workers are surprised by their party bosses' move to remain on the side of the amendment. They so they are also upset, they tell me." Meanwhile, MAGP is planning to ask party chiefs what did they believe on the amendment, whether they wished to vote, meet, consult with state of district people on the move to amend the Act. "We are getting good response. Ballot boxes, signatures will be sent to Speaker of the Lok Sabha, with a note that 'As our representatives are amending RTI without taking our consent, we are compelled to send our votes directly'." The campaign comes amidst the Union law ministry having cleared the ordinance route to amend the RTI Act to overturn a Central Information Commission (CIC) order bringing six major political parties under the ambit of the transparency law. "The ordinance route has been approved. Now it is up to the department of personnel and training to bring it before the Cabinet," Law Ministry officials are being as quoted as saying. Defending the move to amend the RTI Act, a Cabinet note has stated that by declaring political parties as public authorities under the Right to Information Act would "hamper their smooth internal functioning since it will encourage political rivals to file RTI applications with malicious intentions". The note says that the Representation of the People Act and the Income Tax Act provide "sufficient transparency regarding financial aspects of political parties." Under Section 2 of the RTI Act, the definition of public authority in the proposed amendment will make it clear that "it shall not include any political party registered under the Representation of the Peoples Act". The Commission had in its June 3 order said that six national parties -- Congress, BJP, NCP, CPI-M, CPI and BSP -- have been substantially funded indirectly by the Government of India and "they have the character of public authority under the RTI Act as they perform public functions." Hence, they must reveal information sought under the RTI Act to general public.